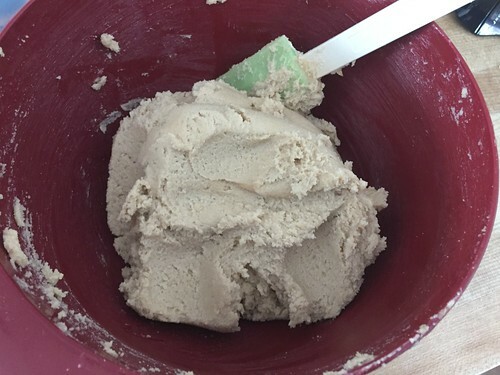 Four years ago, I shared this absolutely DELICIOUS Peanut Butter Chocolate Chip Cookie recipe from my friend Rochelle. This is still my go-to recipe when I want the peanut butter and chocolate combo. 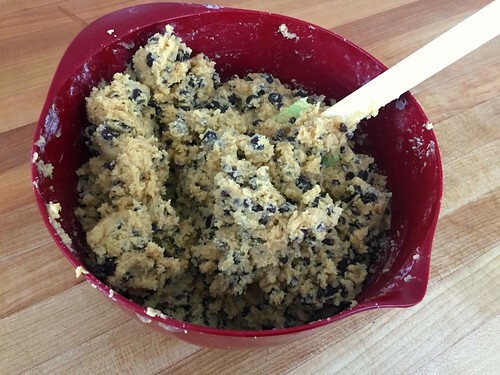 Every time I take these cookies anywhere, I’m always asked for the recipe — they are just THAT good! 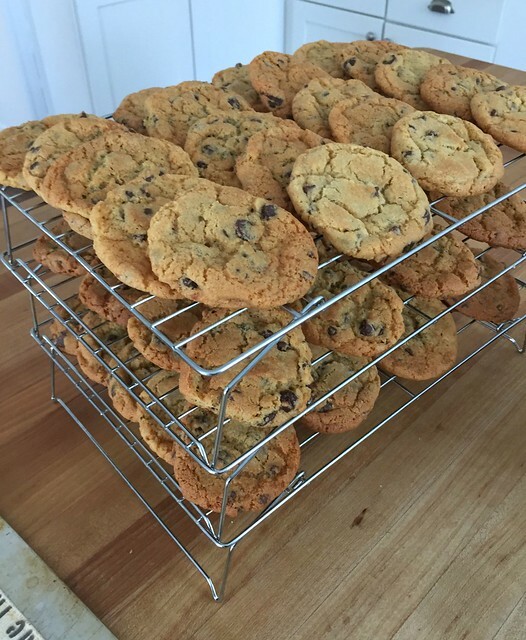 Then, two years ago, I shared a new recipe for chocolate chip cookies (no peanut butter). 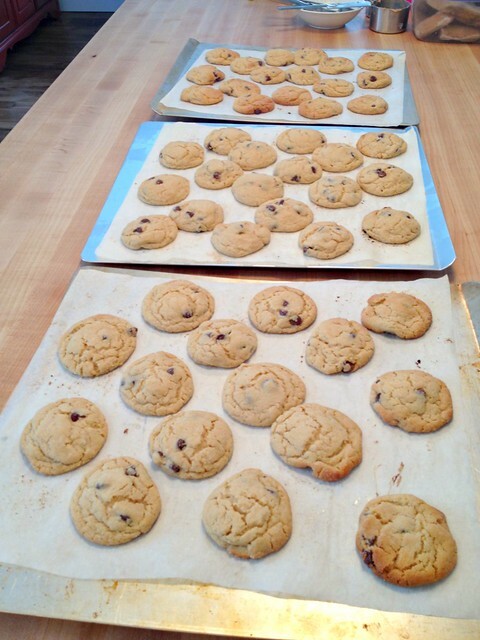 In that cookie recipe post, I also shared several of my tips for really delicious chocolate chip cookies… all of which I still use in my own baking. 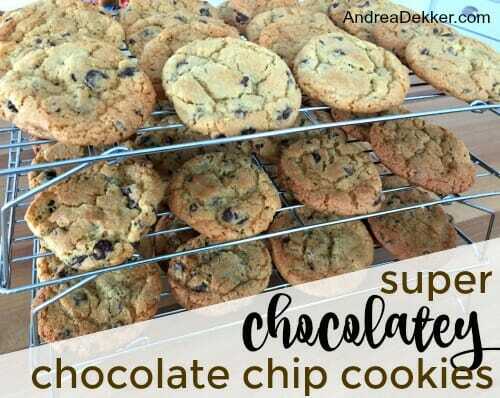 Fast-forward 2 years later… and I have yet another super yummy chocolate chip cookie recipe to share with you all! I was surprised to see that the recipe was fairly similar to my own chocolate chip cookie recipe — with a few minor tweaks. She uses slightly more flour and LOTS more chocolate chips! Finally (and probably most importantly) she mixes her ingredients for a SUPER LONG TIME. 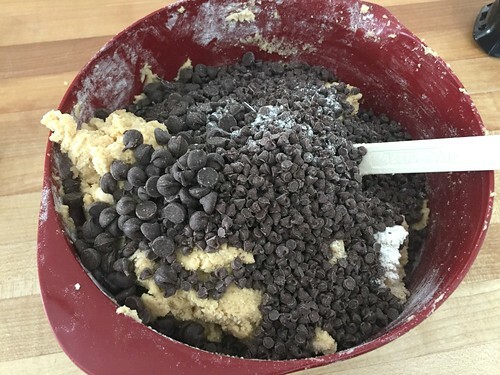 I was shocked that these few differences could make such a big difference in the deliciousness of a chocolate chip cookie — but I have to say, this recipe is definitely our new favorite! Cream butter and sugars with an electric mixer for 3 minutes (scraping down the sides as it mixes). Add in eggs and vanilla and cream for 2 more minutes. Stir in chips with a spatula. Place heaping Tablespoons of cookie dough onto parchment-lined cookie sheets. Bake in preheated oven for 8-10 minutes. (my oven might be “hot” but her estimated cooking time of 12-14 minutes is way too long for my cookies). 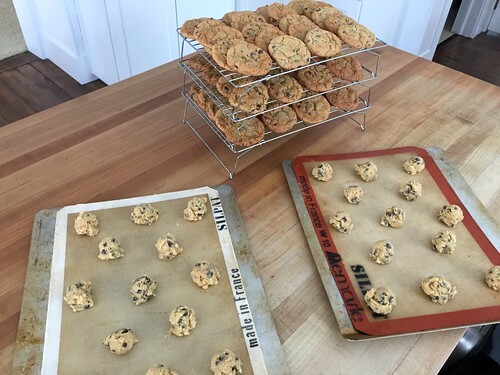 Let cool on pans for 2-3 minutes, then slide parchment sheets onto a cold counter top for 3-5 minutes before placing cookies on a wire rack to cool completely. 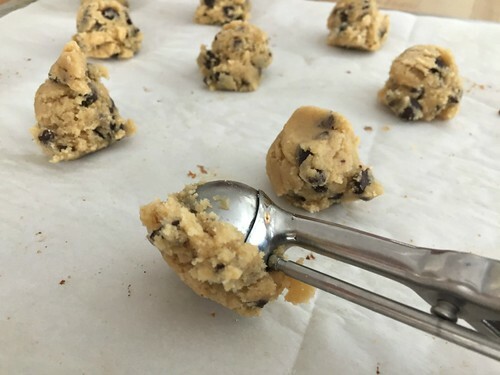 In my opinion, the dough freezes better than the already-baked cookies. For some reason, the frozen cookies seem to go stale much faster than when I freeze the dough and bake the cookies “fresh”. Also, if you want thick, puffed-up cookies, these are NOT for you. They are flat, but SO chewy with a little bit of a crispy outside. Just perfect for us! Oh, and if you want your cookies to look extra gourmet (like if you’re bringing them somewhere), use this simple tip! 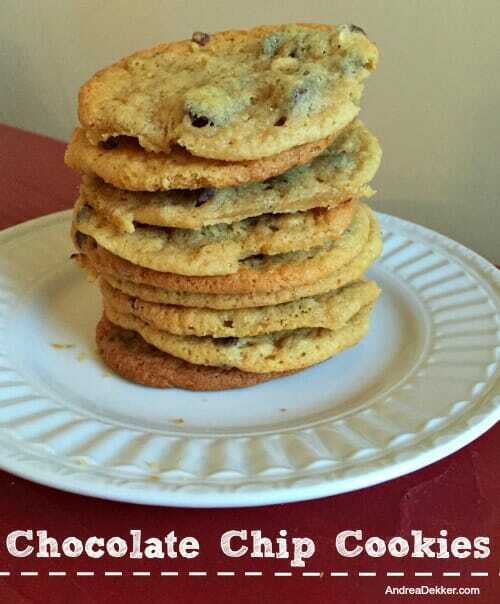 My new favorite chocolate chip cookies… at least for now! 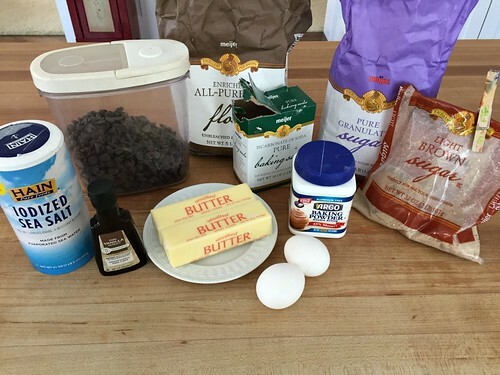 If you have a favorite cookie recipe, please share!! These are just the texture I was looking for. Soft and chewy, but not fluffy and cakey. My family loved them and this is going to be my go-to recipe! yay — glad you liked them!! We LOVE them! I don’t have a whole recipe to share here, but I noticed that the texture of my cookies improved vastly when I accidentally had to use melted butter (trying to soften it in the microwave) and mixed up the order of combining ingredients – I creamed the eggs and sugar together and then stirred the cooled melted butter into it. Then, because the dough was a little soft, I let it firm up in the fridge for a couple of hours. But the cookies set up like the gourmet ones at the mall when they baked! wow thanks Jennifer! I’ll have to try this different technique too. It’s crazy how sometimes, such little things can make a big difference!